In the late part of the 1800s Hester St. was home to largest pushcart market. Today New Yorkers have preserved some of that nostalgia by utilizing the park space for a variety of vendors. And, it is most noted for the artisan food stands! A few weeks ago was opening weekend and it was jam-packed with people out to sample the latest and greatest. By mid-afternoon many stands were already sold out of their signature dishes! I did however get to sample some Mighty Balls and Shaved Ice! Mighty Balls! Not yo Mama’s Balls takes my favorite concept of a few ingredients that you can use to build your culinary creation! I went with a pork slider with African onions and goat cheese. 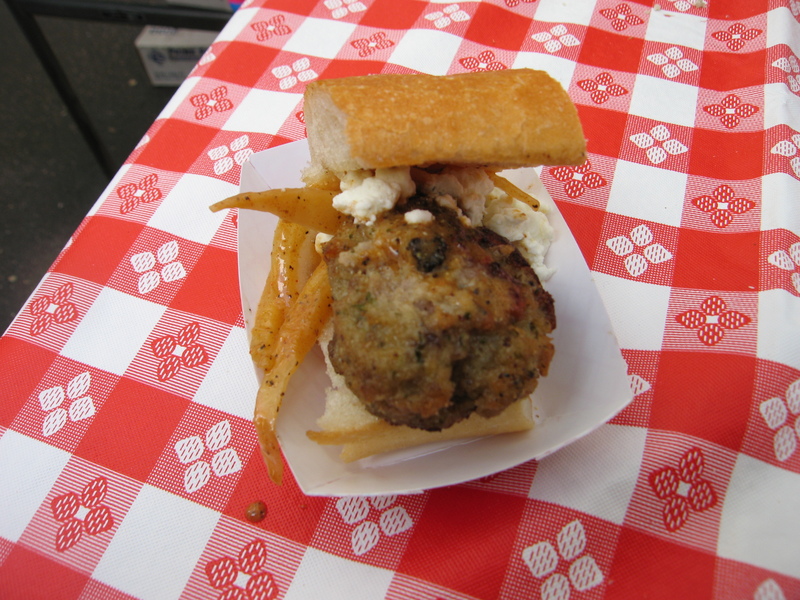 A mouthful of flavor, the spicy onions complimented the juicy ball with the sour/tart goat cheese. Even the slider bread had just the perfect amount of chewy and crunchy. 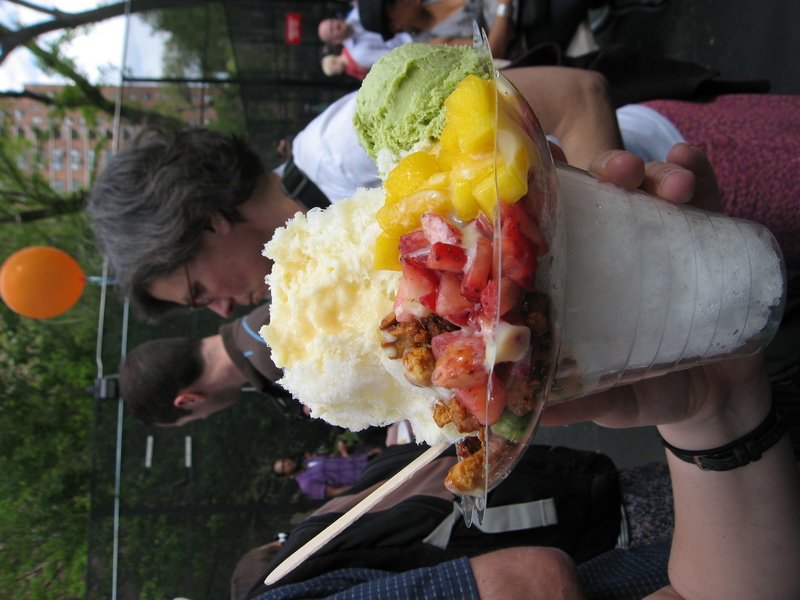 As we were chowing down on our balls we noticed these towering creations of fruit, ice and was that red beans?!? Inspired from the Taiwanese markets, The Shaved Ice Shop serves snowflake-like sha ved ice drizzled with sweetened condensed milk, a scoop of ice cream and a crazy selection of toppings. We stuck with strawberries, mango and went on a limb with the bar nuts! Served with a side of green tea ice cream. Here are some shots from last year that I never got to post. 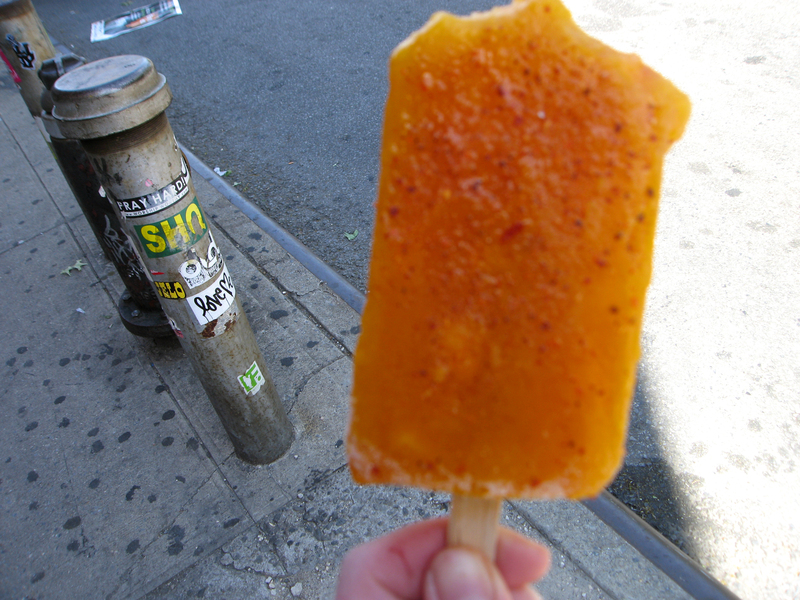 La Newyorkina is a delicious artisan ice pop company with a Mexican flare. I had tried the Mango-Chili! 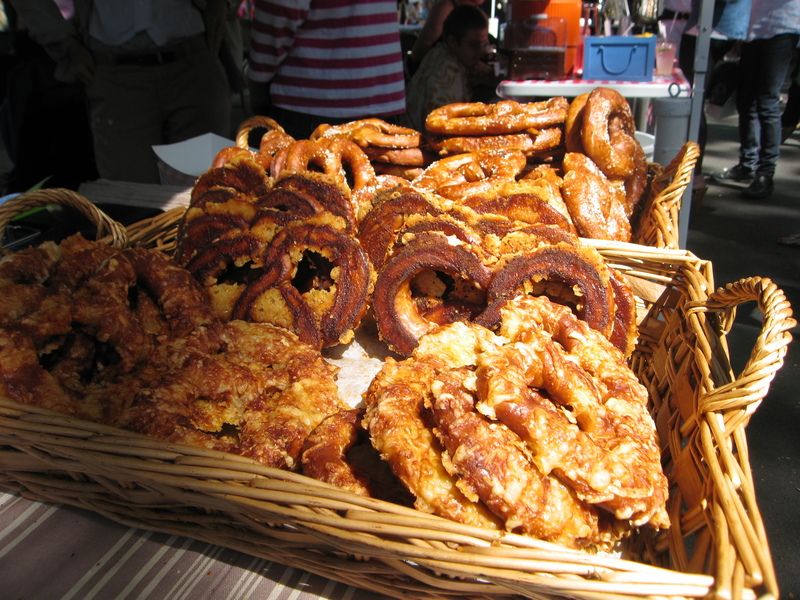 And here is a shot of the Sigmund Pretzels. At the time I think they were offering an Asiago, current flavors range from regular salted to garlic parsley. And of course choose your dipping sauce, how about some nutella or maybe beet-horseradish mayo?! 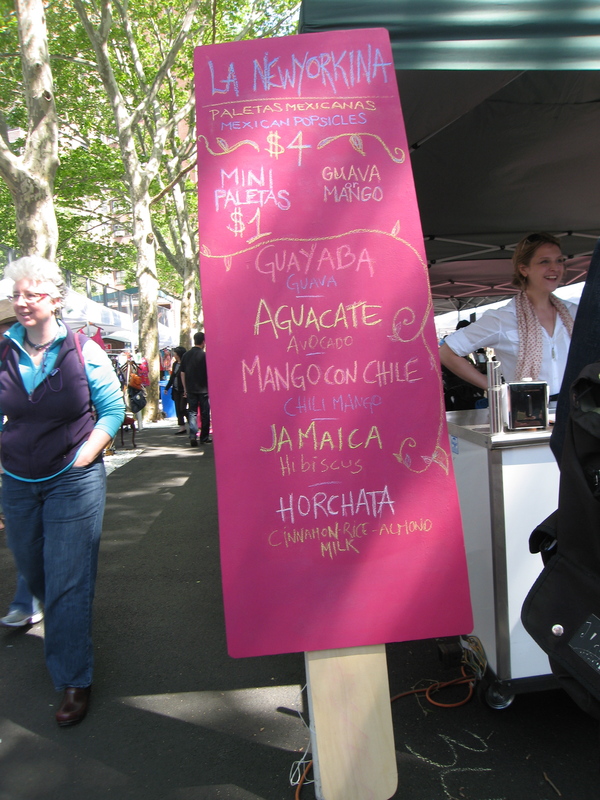 Check out the Hester St. Fair home page for a complete list of vendors and directions. How Well Do You Know Your Dessert? Nothing signifies the onset of warm weather like that single strand of ice cream running down your hand as you savor the creamy frozen deliciousness. As a kid I always had a problem with it dripping from the tiny hole at the bottom of the cone. To celebrate the ice cream and ice pop season I’ve come up with a little quiz to challenge you all (and get some people to post their answers). The first person to post and answer all questions correctly will be the winner!! And (depending on where you live) I’ll make you a fresh batch of homemade ice cream – your choice of flavor! I will post all the correct answers and explanations two weeks from today. Good luck! 1. What is the origin of the name: Häagen-Dazs? 2. What were the original three flavors of Häagen-Dazs ice cream? 3. What are the three main differences between ice cream and gelato? 4. 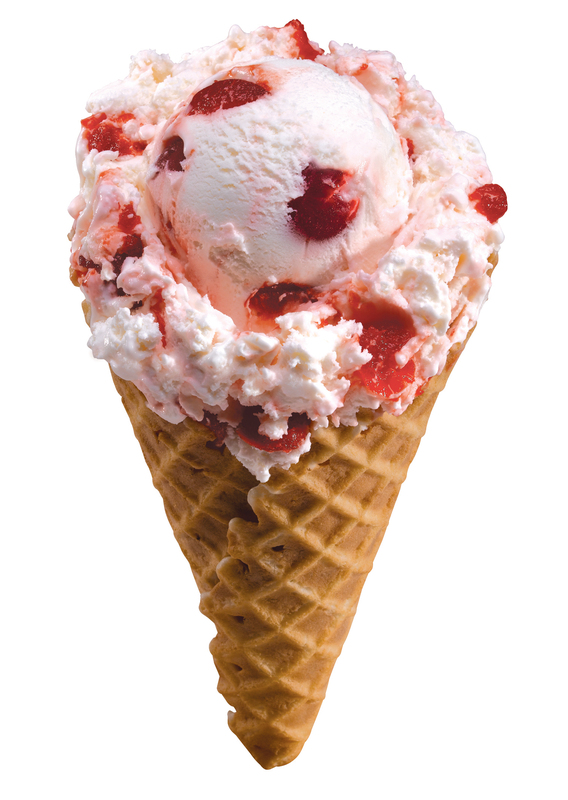 Which first lady is closely associated with the early history of ice cream? 5. What historical New York landmark is associated with serving vanilla ice cream? 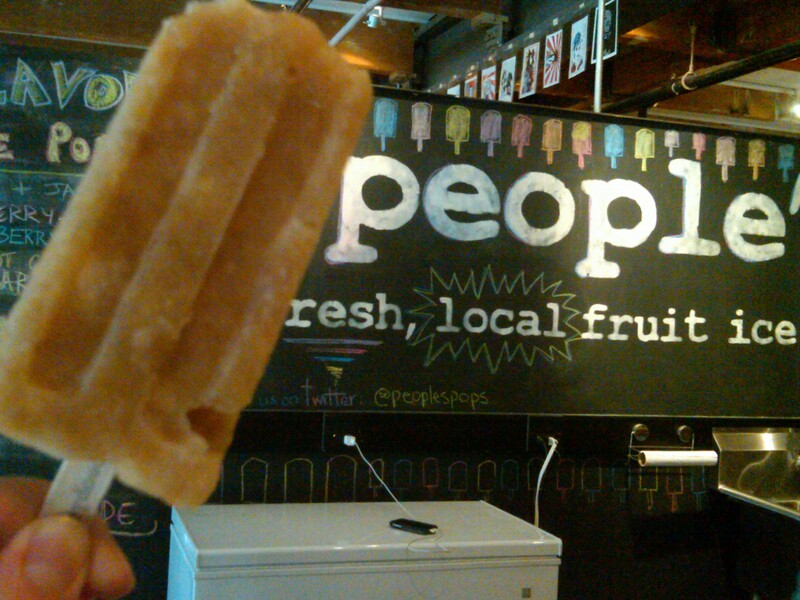 6. Who invented the first Popsicle®? 7. In the 1960s Good Humor experimented with many different flavors for their weekly specials. Which of the following flavors was NOT part of the weekly promotion? 8. Which movie actress was known for her devotion to ice cream sundaes? 9. Which geographical location holds the record for largest ice cream cake? 10. What is the basic definition of a brain freeze? a. Rapid cooling and rewarming of the capillaries in the sinuses. Nothing is better on a hot summer day than the taste of a pure fruit ice pop. Just as you manage to get over the frozen numbness from biting in too fast, a single strand of liquid pop makes it’s way down your hand. Well if you haven’t re-lived this classic frozen dessert moment it’s time to roll-up your sleeves and have a wet napkin near-by. With the cupcake craze taking it’s final bows it seems ice pops are the new ‘it’ dessert. I was first attracted to this notion when I heard about a group called People’s Pops opening in the Chelsea Market in Manhattan. I thought what a smart business venture and they even source local fruits and herbs! The Queen of Trend herself, Martha Stewart has even featured them on her show and published her own ice pop recipe in this month’s issue of ‘Everyday Food.’ Another budding entrepreneur is Mexican inspired company La Newyorkina which plunge into my favorite sweet and spicy combination! Their spicy mango pop put my taste buds into pure chaos! Aside from all this buzz I even walked by Williams-Sonoma the other day to find a window display devoted to tools and cook books for the pops! Using a traditional mold from a local baking goods store I made some really fun mango kiwi pops; even added a little vanilla yogurt to some. The trick, however, is to really have some nice ripe fruit and to add a healthy amount of a sugar depending on your audience. What I like best about this new cooking project is you don’t have to be a pastry chef or even follow a recipe! Cooking is all about being creative and trial and error; making the traditional, non-traditional! 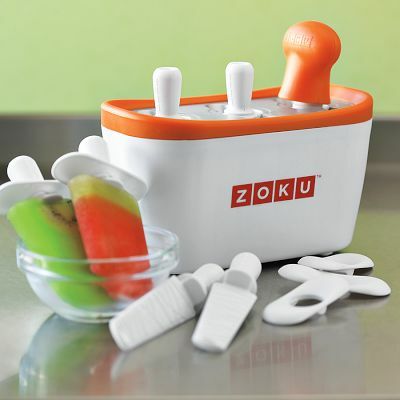 You may even want to try an ice cube tray and pack them in a cooler for the beach. Keep ‘em simple or make ‘em crazy. Maybe even a little coconut rum would make for a great flavor affinity to a mango or pineapple pop! Either way, hope you get your sticky hands on one soon! Pour blended mix into mold and freeze for about 3 hours. Let mold defrost slightly before pulling out of mold. Adjust consistencies with more liquid or solid ingredients. Taste before freezing to ensure desired outcome!